Here's a stately four-story Cobble Hill, Brooklyn townhouse on one of the neighborhood's most sought-after blocks. Designed as a five bedroom owner's triplex with a top floor rental to afford plenty of living space and high income, it's possible to convert to single-family use, or to a garden level rental with owner's triplex above. 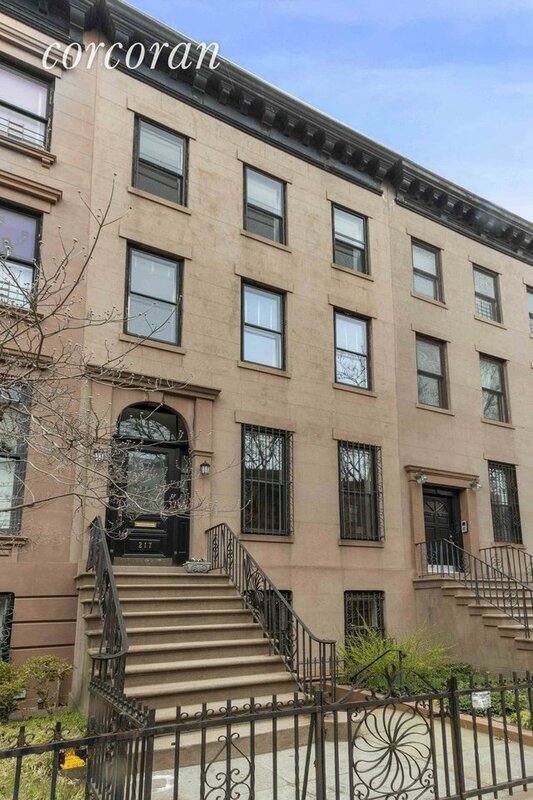 At 20 feet wide and 43 feet deep with a gorgeous brownstone facade, stoop and lovely garden, this is the perfect dream home to use as is or to reconfigure. The triplex is connected by a modern steel and wood staircase from the garden floor's living room, dining room, kitchen and full bath to the five bedrooms and two baths on the second and third floors. Open landing areas on the second and third floors give the triplex extra work or play spaces. The top floor is a bright, open and lofty space with a bedroom and office, kitchen and full bathroom - easy to incorporate into the rest of the home or use as is. The full basement with excellent ceiling height contains a work room, mechanical room, and tons of room for storage. With the historic carriage houses of Verandah Place behind it, this brownstone has wonderful exposure from all floors as well as from the serene garden and patio. 217 Warren Street sits on a gorgeous, landmarked Cobble Hill block, around the corner from some of the most popular shops and restaurants on Court and Smith Streets, and just minutes to all of the neighborhood schools, the 2-3-4-5 trains at Borough Hall and the F at Bergen Street. Brooklyn Bridge Park, charming Brooklyn Heights and the exciting shopping and dining destinations in Downtown Brooklyn and DUMBO are just minutes away.